The main advantage of bridge rectifier is that it produces almost double the output voltage as with the case of a full wave rectifier using center-tapped transformer. 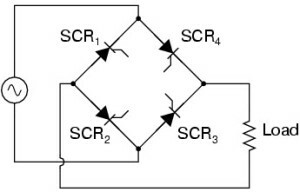 But this circuit doesn’t need center tapped transformer so it resembles low-cost rectifier. The bridge rectifier circuit diagram consists of various stages of devices like transformer, Diode Bridge, filtering and regulators. Generally all these blocks combination is called as regulated DC power supply that powers various electronic appliances. The first stage of the circuit is a transformer which is a step-down type that changes the amplitude of the input voltage. Most of the electronic projects uses 230/12V transformer to step-down the AC mains 230V to 12V AC supply. Next stage is a diode-bridge rectifier which uses four or more diodes depending on the type of bridge rectifier. 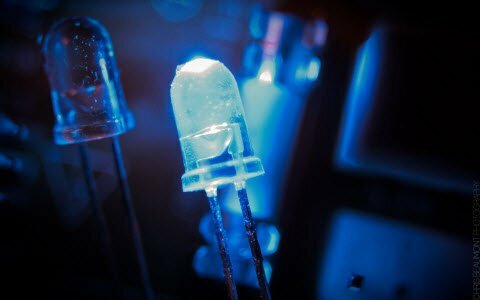 Choosing a particular diode or any other switching device for a corresponding rectifier needs some considerations of the device like Peak Inverse Voltage (PIV), forward current If, voltage ratings, etc. 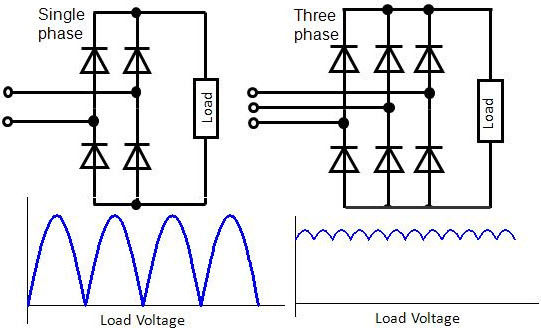 It is responsible for producing unidirectional or DC current at the load by conducting a set of diodes for every half cycle of the input signal. 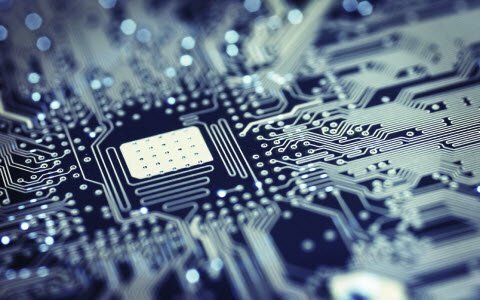 Since the output after the diode bridge rectifiers is of pulsating nature, and for producing it as a pure DC, filtering is necessary. Filtering is normally performed with one or more capacitors attached across the load, as you can observe in the below figure wherein smoothing of wave is performed. This capacitor rating also depends on the output voltage. The last stage of this regulated DC supply is a voltage regulator that maintains the output voltage to a constant level. 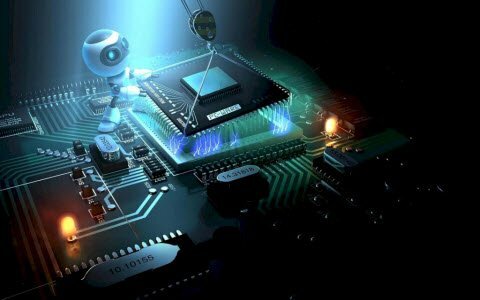 Suppose the microcontroller works at 5V DC, but the output after the bridge rectifier is around 16V, so to reduce this voltage, and to maintain a constant level – no matter voltage changes in input side – a voltage regulator is necessary. 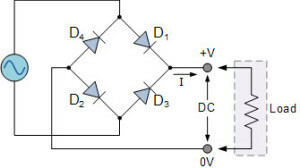 As we discussed above, a single-phase bridge rectifier consists of four diodes and this configuration is connected across the load. For understanding the bridge rectifier’s working principle, we have to consider the below circuit for demonstration purpose. During the Positive half cycle of the input AC waveform diodes D1 and D2 are forward biased and D3 and D4 are reverse biased. 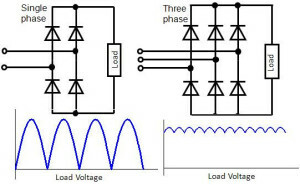 When the voltage, more than the threshold level of the diodes D1 and D2, starts conducting – the load current starts flowing through it, as shown as red lines path in the diagram below. During the negative half cycle of the input AC waveform, the diodes D3 and D4 are forward biased, and D1 and D2 are reverse biased. Load current starts flowing through the D3 and D4 diodes when these diodes starts conducting as shown in the figure. We can observe that in both the cases, the load current direction is same, i.e., up to down as shown in the figure – so unidirectional, which means DC current. 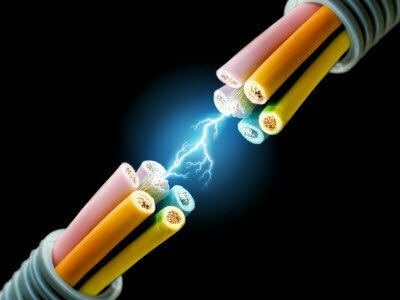 Thus, by the usage of a bridge rectifier, the input AC current is converted into a DC current. The output at the load with this bridge wave rectifier is pulsating in nature, but for producing a pure DC requires additional filter like capacitor. The same operation is applicable for different bridge rectifiers, but in case of controlled rectifiers thyristors triggering is necessary to drive the current to load. 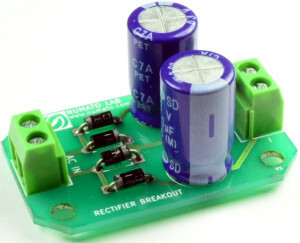 This is all about the bridge rectifier theory its types, circuit and working principles. 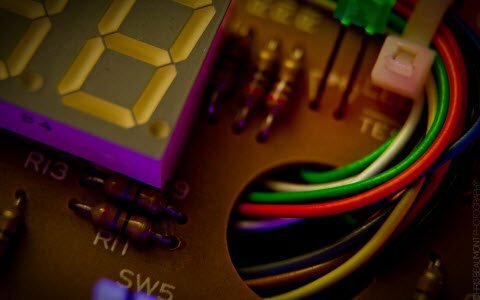 We hope that this wholesome matter about this topic will be helpful in building students’ electronics or electrical projects as well as in observing various electronic devices or appliances. 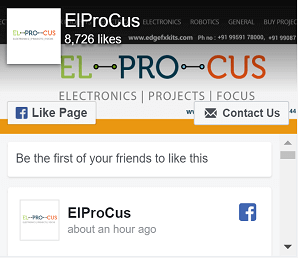 We appreciate you for your keen attention and focus on this article. And therefore, please do write to us for choosing required component ratings in this bridge rectifier for your application and for any other technical guidance. Thanks for your feedback and wish you good luck. Thanks for the sharing details description on this Bridge Rectifier theory.